The Saints game from an aerial perspective was pretty good. QB ratings weigh substantial value to TD's (of which the Cowboys had 0 through the air) and INT's (of which the Cowboys threw one). So, an otherwise solid night does not quite look as good from a QB Rating perspective with 0 TDs and 1 INT. However, Kitna, once again, was quite effective and the receivers and tight ends were very strong. Except for Dez Bryant. For the 2nd consecutive week, Dez had very low numbers. In fact, the Detroit and New Orleans games represent the two lowest outputs for Dez all season long. Bryant has been a monster and it is clear that he is getting different coverage looks, so I would not call this a large concern. But, the opponents are not just going to sit around and wait for Bryant to kill them. On 3rd and 4th Down, the Cowboys did pretty well. Of course, the 3rd Downs at the end did betray the Cowboys. A long reception to Roy Williams looked like the dagger but then became a fumble. And the final 3rd Down was a poor attempt to get Dez Bryant the ball. But, aside from Dez, Kitna was 9 for 9 and they are really getting nice production from a backup QB. Here is a moderately interesting trend. Under Wade Phillips, Felix Jones had 157 yards receiving in 8 games for a total of 19 yards per game. Since Jason Garrett has taken over, Felix has 189 yards receiving in 3 games for 63 yards per game. Also, a total of 335 yards of Rushing + Receiving in 3 games for 111.6 total yards from scrimmage in the last 3 games. Not Earl Campbell, but if you can get 100+ yards from Felix Jones, you have to feel much better than earlier in the season when he had many games of less than 50 yards total. It is still very interesting to see the difference between Jason Witten's overall numbers and his numbers on 3rd and 4th Down. He had a slow start and rallied very nicely overall, but still, the Cowboys' opponents refuse to let ol 82 beat them on a money down if they can help it. Totals: 6 penalties, with 4 accepted for 19 yards. The offense had 2 penalties, the defense 2, and special teams had 2 as well, so it was spread out fairly. 19 yards in a game? For the Cowboys? There was nothing wrong in this department. Worst Offender: Nobody wins this category this week. What a great battle among the offensive line to see who can win the season title for "most penalized". Gurode is gaining on the top with Colombo and Free. DeMarcus Ware still tries to anticipate snap counts and still manages to be called routinely for offsides. I have watched a lot of football and cannot say I have ever seen a Punter called for an "illegal kick" before. First time for everything. Time now to look at some of the more pivotal plays from the thriller against the Saints. Let's see what is working and what is not here. What Happened: I hope by now you see what the Cowboys offense wants to do. They want to keep you in uncertainty as a defense by running when you think pass and passing when you think run. "22" personnel is a heavy group that consists of 2 RBs and 2 TEs. This has often been the Cowboys most difficult group to defend against. The 1 WR lines up on one side and because it is Miles Austin, he demands a double team with a corner in front of him and a single high safety. If the safety leaves, the play will go to Miles in man to man with nobody behind them. If Miles occupies 2 DBs, now the Saints have 9 in the box to stop the run an the Cowboys can use Jason Witten as a big weapon going the other way. If you put 9 in the box, that means the Saints strong safety - 41 Roman Harper - has to run with Jason Witten on a play action fake and now Witten can run a route on the opposite side of Austin and stress the defense with his ability to run any route in space and Harper is at his mercy. Harper does a nice job, but the Cowboys get a nice gain here based on the pass/run conflict the Saints were placed in. If Harper sits back off of Witten, then the Cowboys will run the ball here. I love "22" in early down and distances. The Cowboys have perfect personnel to do it. It would be even better if Martellus Bennett ever broke out. What Happened: Here is "22" again, but the Cowboys on 4th and 1 are not going to fool the Saints here as much as they try. First, they have Felix out and Marion in which tells the Saints by tendencies that the Cowboys are going to run it between the tackles. When the Cowboys run Barber wide, it might frustrate you, but it is going against tendencies and for that reason it just might work. But, when Roman Harper protects the flank by crashing on top of RT Marc Colombo. This makes Barber have to hurdle a man at the 25 yard line when the line of scrimmage is the 21. Obviously, most fans are mad at Barber for the result here, but when you are dodging players 4 yards deep, this play is destined to fail. In retrospect, there are a dozen better ideas, but this play is usually a successful one when the Cowboys are rolling. But the Saints dedicated the kitchen sink on this one, and they deserve some credit here. I am not sure it is fair to single out Colombo, because as I look at the play repeatedly, I am not sure what he could do here. He is just out-flanked. And once Harper slows the flow, Dunbar, the linebacker has time to make the play at the turn. What Happened: Every week we are trying to see if Felix Jones has what the Cowboys need to be an "Every Down" back. Here is one of those plays that tease us into thinking he is worth all of this trouble. His burst here at the corner is what makes a 3 yard gain into 10. I believe if Barber is the ball carrier here, the Cowboys are facing 2nd and 7 because Marion doesn't have that extra gear. Felix does and you see that rare flash. Gronkowski with a decent enough lead block, but Felix has to make a player miss on the edge and does a fine job. Also, Doug Free looks good again blocking in space and making the play possible on a weakside run. What Happened: What are we seeing more and more of as the season progresses? Felix Jones screen plays. They can be run best with "11" personnel in and then the Cowboys make you make a tough decision as a defense. This time, they line Witten and 2 WRs to the right. The Saints are manning up on their defense, so when all 3 of those targets get off the line of scrimmage and into their routes, we see a clear-out of that side of the field. Once the screen is executed quickly, now Felix is in space and his speed does the rest for a quick +28 yards. This is great design and a reason we are hopeful that Garrett has creative ideas to utilize Felix more. Obviously, he isn't a traditional back, and so you must figure out how to use his strengths more and more. The screens seem to be the answer. What Happened: Pause this play right before the snap and see the unbalanced line to the right. The Cowboys are declaring strong right run. Free is outside Colombo on the right. Now, here comes Witten in motion to the right. If you are a linebacker or a safety for New Orleans, you see a ton of beef on 2nd and 2, so you believe this is right run. And this is where tendencies can get you killed. Martellus Bennett is playing left tackle on this unbalanced line, so when Austin comes around on the end around, it is all about giving Miles a 1 step head start for the corner. From there, the blocks of Roy Williams, Felix Jones, and the block/hold from Jason Witten gets the Touchdown. But the design and the chess game of the play is what makes is a great idea even if it only gets 10 yards. This is another case of Garrett properly using all of his weapons and ideas. We accuse him of getting too cute sometimes, but this is really good stuff. What Happened: The thrill of victory and the agony of defeat all in 1 play. It is 3rd and 6, and the Cowboys feel that if they can convert this it is game over. They are in "S11" and only one WR is being pressed, Roy Williams. Interesting that the Saints want to press him, while giving Dez Bryant and Miles Austin free releases off the line on 3rd and 6, but Greg Williams knows what he is doing. The rookie, 34-Patrick Robinson, falls down on the play and Roy Williams is off to the races. I detailed on Friday that although Malcolm Jenkins made a great play, Roy does have a bit of a track record of turning great plays into fumbles in the last year or so, which makes me wonder why a strong guy like him doesn't guard against this much closer. Still, everything worked except the large detail that didn't. That slim margin for error rears its ugly head. Nice throw by Kitna and nice execution by all involved (picking up the blitz), but what a shame. This is one of those weeks where we should consider renaming this feature. "Decoding Garrett" has meant one thing from 2007 until earlier this month - the idea of breaking down the performance of the Offensive Coordinator of the Cowboys. Now, if someone reads the headline, they might read into it a larger meaning of breaking down the performance of the Head Coach. Please understand that I did that here on Friday, but this particular entry is all about the Cowboys' offense. With that in mind, there is a lot to like about how the Cowboys offense moved the football. The 445 yards in total offense that they accumulated on Thanksgiving Day would long be exceeded this season by their Week 4 performance of 508 yards against Tennessee. Ironically, they have lost their 2 most productive performances this season - both at home. I would imagine that the win-loss record of Cowboys teams that get 445 yards is quite impressive, but this has been one of those years where you throw out normal results. 445 yards, 6.1 yards per play, and 34:41 in Time of Possession tell us that the Cowboys - even with Jon Kitna - have an offense that is promising in some regards. What has always separated them from the truly poor offenses in this league is their impressive explosiveness that can unleash at any moment. Miles Austin, Dez Bryant, and Roy Williams all have "big play" ability, and that is both a blessing and a curse. A blessing because on any play they can take it all the way. A curse because when they don't get wins, people want to know why you "waste" all of this talent. The fact is, the Cowboys are not as good as they should be, and this is a result of not having the offensive line that most (if not all) offensive schemes require. Another component to consider as we look at all of this data is that the Cowboys knew they were in a situation that is quite the opposite of playing Detroit. When playing New Orleans, an offensive coordinator has to know that it will take a rather impressive offensive display to keep your team in the game. Balance is nice, but when you need your team to get into the 30's on the scoreboard, you are going to have to have a more aggressive posture in the huddle. And of course, another reason why the Cowboys were passing the ball early and often is that they fell behind 17-0 early. A devastating 1st Quarter was a difficult hole to climb out of, but the Cowboys did a fine job of doing just that. The margin for error in the NFL is often very slim, and for the Cowboys offense, 75 plays can be boiled down to that Roy Williams/Malcolm Jenkins meeting late in the 4th Quarter. If Roy secures the ball, we are celebrating a fabulous offensive performance. But Jenkins strips Roy of the ball and suddenly we look at all of this data and still say "not good enough". It is both a true and false conclusion. All of the above numbers are off the charts positive. Great 2nd down and 3rd down "To Go" averages. That means the Cowboys are productive in the early downs in this game and setting themselves up with manageable situations on the later downs to try and accomplish their objectives. In theory, you can't be too excited about just 12 runs in 32 1st Down plays, but it seemed to be working so "you play to win the game" not to have balanced ratios. Sometimes you must go inside the numbers to see what these charts mean. "12" personnel looks extra impressive when the Cowboys ran the ball, but that would be mostly a result of Miles Austin breaking an end-around for 60 yards and a Touchdown. "23" personnel only had 2 carries for 2 yards, but they were both 1 yard Touchdown runs. And "S11" looks poor on the ground (6 carries for 2 yards) but it is affected by Andre Gurode's ridiculous shotgun snap that lost 17 yards in the 1st half. All success or failure comes down to one fumble and one scenario where the defense cannot keep the Saints out of the end zone. Or maybe it is the the few feet to the left that David Buehler's FG sailed. Regardless, either you win or you lose, and that is the only real stat that matters for these guys. But as an offensive coordinator, you must be careful in a win or a loss throwing the baby out with the bath water. You have to be able to evaluate every player and every play independently of the final score if you want to stay in the league. Plenty of good happened for the offense, and they need to continue to build on that heading into Sunday at Indianapolis. Check out the video supplement that will be posted a bit later today. * Part of being a team that is capable of winning a Super Bowl is the ability to figure out a way to get a win - especially when the team is not playing as well as it can. The Saints entire 2010 is shaping up like that, as they are 8-3, without playing to their standards of 2009 in many regards. Yesterday is a perfect example where the Cowboys emotional level was extremely high and the momentum of the game was getting away from the Saints. But, all you have to do against a good team is leave the door cracked just a little and they will come storming through. Surely this is what happened yesterday. The Roy Williams fumble will be long remembered in Dallas as a ball you must secure. But, from a Saints perspective, it was stealing victory from the jaws of defeat by Malcolm Jenkins. What a clutch play and the momentum stealing scenario that can be the difference in not only a game, but a season. We saw the Cowboys "figure out" how to win games that they could and should have lost back in the 1990's and the opponents would shake their heads on the way back to their airplanes in disbelief. Winning is often decided on one moment, and that fickle hand of fate smiled on the Cowboys when Bryan McCann worked his magic against the Lions, but perhaps things evened out when Jenkins ripped a victory out of Williams' arms. * Great to see Jesse Holley make a play like he did when he stripped Reggie Bush of the ball on a punt return. I must admit that I thought another amazingly absurd moment in Cowboys' history was when they allowed Michael Irvin to determine a spot on the 2009 training camp roster on his silly reality show. This further undermined a personnel department that is constantly under fire for the way that Jerry Jones finds talent. Nevertheless, Holley, who was an accomplished college player at North Carolina, has turned into a reasonable special teams contributor on the 2010 Cowboys. That is the good news. The bad news is that of all of the Cowboys to join the franchise in 2009, Holley is on the very short list with David Buehler and Victor Butler as the biggest contributors to the team. The 2009 draft has been an unmitigated disaster, and if the only items you get for an entire year of talent gathering is a kicker who is under fire, a backup LB who hardly plays, and a special teams-only player who made his first NFL play of substance yesterday, you know that times are tough. * Andre Gurode's inability to perform a shotgun snap on time is a wonder. I think he is generally a decent lineman (but 4 straight pro bowls? ), and I might offer you the opinion that he is, at worst, the 2nd best lineman for the offense this season. But, wow. Talk about killing drives, there is no better way to zap any sort of momentum completely out of an offense than an off-timed shotgun snap that even if it was at the proper time, it missed its target by a few feet. This is likely a good time to remind all involved that this offense is not capable of overcoming a 17 yard loss because of a poor snap. What a killer. And in the blink of an eye, the Saints had a 17-0 lead. * One of the plays lost in the shuffle was the Saints conversion of 3rd and 10 in the 2Q, when Drew Brees faced an intense blitz that should have secured him. Surely, the Cowboys had the play properly defended, but he somehow found Julius Jones in open space who then was able to make Orlando Scandrick miss and grabbed a 12 yard gain to move the chains. Scandrick is certainly a nice story and a good competitor, but his inability to tackle with more regularity is bothersome in a secondary where it seems like there is very little quality tackling. You might be able to live with a small corner or two in some secondaries, but it sure looks like the Cowboys have nobody in the back half of their defense that consistently brings the lumber. * How many breaks did the Cowboys get yesterday? Fumble after fumble bounced right back to them. They actually fumbled the ball 7 times and somehow only lost 2. Reggie Bush dropped a sure touchdown in the 3rd Quarter. 2 reviews properly went the Cowboys' direction. It seemed like all of the Thanksgiving forces were going in their favor and conspiring for a win for the home side, and yet they still lost the game. It is just one of those years. * Blitz pick-up 101: If you ever see yourself in the spot where Marion Barber was yesterday in the 3rd Quarter, on a 3rd Down and 6 situation, and 2 players are blitzing on your side, don't ever take the outside man! They will teach you early in life and it will never change to always block the inside player and leave the outside player to the QB. This will help extend the life of your QB and give your team a better chance to succeed. Amazingly, Jon Kitna still completed the pass and the Cowboys gained the 1st Down, but Barber will surely be called out in film study on that odd decision. * Was it Dez Bryant's worst game as a pro? 6 targets for 0 catches and a tantrum on the sideline. Every week, I marvel at his ability, but to review the reason several teams passed on him on draft day was an overall feeling that despite his ability he was not going to be worth the trouble. Is it a fair characterization? Maybe, maybe not. The fact is, there is no position in professional sports that generates the maintenance requirements of the NFL Wide Receiver. They are loud, they act entitled, and they seem to get more and more difficult to deal with every year for teams. Why aren't Running Backs as a group thought of the same way? I have no idea. Regardless, the fear around the league was that Dez is going to be another guy who is "too much trouble". Another diva, who if he doesn't get his proper amount of ball distribution, he was going to throw a fit. And when that happens, divas will undermine a QB, a coordinator, and a head coach without thinking twice. I trust this won't be a trend, and that Ray Sherman has it all under control - as it appeared he did yesterday. But, I would prefer that Dez stays on point and understands that even if he has 1 catch for 1 yard and the Cowboys win, he had a successful day. * One thing we are forgetting about after the Roy Williams fumble is the simple reality that the Cowboys defense still could get a stop at the moment of truth. 3 minutes to play, 4 point lead, Saints are 89 yards away from the end zone. They must score a Touchdown and will only get 1 possession to do it most likely. So, I need my defense to get a stop. This game all comes down to this. 1st play - Colston for 22. OK, but you can still hold firm now. Meachem for 55 yards as he goes right past my best defensive back in Terence Newman. Now, they are at your 12 yard line. But, if you can just pull it together and keep them from a Touchdown, the Cowboys will still win. 1st snap, Lance Moore beats Mike Jenkins for the Touchdown. Dagger. The defense conceded way too easily. 3 plays gathered all 89 yards in about 1 minute. The bottom line is that this is a performance based business. If you fumble, they are going to go for the ball even harder next time, and I would suggest that Roy Williams is building a case that says he will continue to be a target. Rest up, Peyton Manning and the Colts are next. What components must be considered when selecting the proper head coach for the Dallas Cowboys? I think we see that this is a more complicated decision (or should be) than many of us sometimes consider. In the case of interim coach Jason Garrett, the evidence is starting to work its way into proper focus. Seldom do you get the opportunity to "test drive" your potential coach, but the second half of the 2010 season is appearing to be more and more about that. Very simple question with a very simple answer. Do the Dallas Cowboys play hard and play tough for Jason Garrett? Do they follow him into battle with every fiber of their being dedicated to representing the Cowboys proudly? Do they respond to what he says and believe that if they listen to him, he will figure out a way to get them into a position to win? I don't think there is much question that the makings are there to believe that he is prepared to fill this position. Again, on Thanksgiving Day, he says the right things, he looks the part, and most importantly, his team appears to be willing to take a bruise to help the team. I realize that every time I type this sort of thing it is somewhat laughable about how far we have lowered the bar with respect to where the Dallas Cowboys normally judge themselves, but it had to be done. You have to build a foundation first, and the foundation here had to remove the "country club" mentality that seemed to cover this organization during the Wade Phillips administration. We know the Cowboys ownership make things difficult for their coach if he is not a born leader. A guy like Wade will have the players looking over his head to see their true boss, and the sad thing about Wade was that it seemed like he actually didn't mind. This never sat well with me, and whether perception is reality can be debated, but I believe that Garrett demands some level of respect and wants the players to look at him when he is talking. Through 3 weeks, I believe I have seen the highest level of effort and intensity from the Cowboys. Intensity does not equal excellence all of the time, and when a team like the Saints matches your level of fight then it is going to come down to talent and execution, but I see the passion returning to the Cowboys sideline. 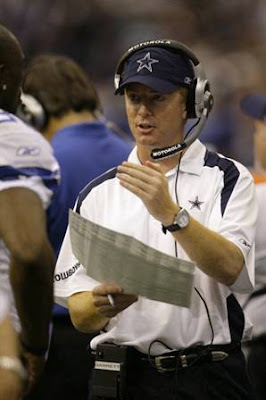 In 2008, the Cowboys quit numerous times on their leader, Wade Phillips. After 44-6 in Philadelphia, when they quit in a game with their entire season hanging in the balance, Jones should have fired the supposed leader of his team. He did not, and from there, it seemed just a matter of time. They may have liked him, but they didn't emotionally respond to him often enough. It may happen to Garrett, too, and we may look back and realize that the problem was with some of the players, but for now, I going to suggest that Garrett meets my level of expectation in this category. It looks like they respond to him. It is not a given that players react to an "interim" label, but the difference between early and late November is shocking as it pertains to this team's will and pulse. With yesterday's taste still in my mouth, this appears to be a topic that will come under the greatest scrutiny. On the other hand, this is also the nature of the job. In the Saints game alone, we can point at the play call on the Marion Barber toss on 4th and 1 in the 2nd Quarter as a very questionable decision. Since the play failed, it is very easy to say that it was a poor call. There are subjective judgements and objective judgements in this business. There is nothing subjective about 4th and 1. Either you get there or you don't. How about the idea of a toss to Barber? I know many people suggest you run Barber between the tackles and Jones on edge plays. But here is the problem with that elementary thought process: The other team knows it, too. Can't we assume that if Barber is in the game, the Saints are sitting between the tackles and playing the tendencies on Barber? And if so, could you argue that the only reason it was a poor play call was that Marc Colombo was pushed back into Barber's path? But should they have kicked there? And then, should they have gone for it on the very next drive from the 2 yard line, instead of settling for 3? Are both of these decisions made easier if you think your offensive line is a mess? On the other hand, isn't that the best time to find out how good your coaching is? If they can scheme around a poor offensive line, then that should demonstrate what they might be capable of if they ever had an excellent line. When you are the offensive coordinator, you do not have to decide anything more than which play you would run if the coach tells you he wants to go for it. You don't have to first consider the entire idea of going for it - and what that means to your defense if you don't make it, the context of where you are in the game, and all of the ramifications involved. But as the head coach, Garrett makes decisions on accepting penalties, calling for reviews (he got them right yesterday), going for it or kicking, and then calling plays on top of all of that. You may now understand why many head coaches resist the urge to call all their own plays. It is just too much on your plate. Ideally, you might want to oversee the effort, rather than trying to do it all on your own. Later in the game, Garrett did not allow his kicker, David Buehler to attempt a 53-yarder in the 4th Quarter, down 23-20 - despite the fact that Buehler already made a 53-yarder before halftime. Instead, he opted for a punt that did not achieve the ideal result. Then, to further complicate matters, he had to settle for a 59-yarder as his last gasp effort to get those 3 points in the final minute. The 59-yard attempt was not the major strategy question there, but rather why did the Cowboys not work the middle of the field more on the downs leading up to it with 2 remaining timeouts. Instead, 3 consecutive throws to the edge for Dez Bryant fell incomplete. As we have said, if any of those throws get to Dez like the play is designed, then Garrett's decisions aren't picked apart. But, like every decision that every coach ever makes, the concept is not judged - but, the result is. And the results of 3 throws to Dez Bryant were 0 yards closer for that tying FG attempt. So, is Garrett ready and able to get all of these decisions right? Of course not. No coach gets them all right. He simply has to out-perform his competitors. So far, I would suggest that we will need a much larger sample size on this one. Now, this particular component of my perfect head coach scenario might be more about my preferences and not those of the only guy who really matters here, Jerry Jones. But, I think it is vital to the advancement of this franchise to have a coach who can get in that decision room with Jerry and Stephen and argue hard for his position on player evaluations. You see, I really have no idea how much say Wade Phillips had when it came to personnel. Was Felix Jones his idea? Was the Roy Williams trade something he needed to see completed? Did he campaign for Stephen McGee in the war room? How about Jason Williams and Anthony Spencer on draft day? You hear whispers, but most of it is hearsay. However, when this team had ideal coaches under Jones, named Jimmy and Bill, I have no question that they not only had an opinion, but also made the call on who the Cowboys would acquire and what they would pay. Can I trust that Jason Garrett is deciding which RB is getting the most snaps? Can I believe that Garrett has the power to bench Leonard Davis or Marc Colombo? In the off season, will Garrett argue hard for or against Roy Williams and Marion Barber coming back? Will he take a stand on whether he believes Keith Brooking is still capable or whether both safeties must be replaced? If the answer to any of these questions is "No", then this thing is broken beyond repair, and we must hope against all hope that Jones hires Bill Cowher and concedes control of the football operation to someone he believes is capable. If he thinks Jason Garrett is another in a line of Chan, Campo, and Wade where Jerry can continue his poor track record of personnel decisions and the head coach sits in the corner and bites his tongue, then Garrett is not the man for the job. This team is 3-8. They may seem close to contending in your mind, but reality is 3-8 and that is not close. They need a coach who can handle all 3 of these departments and they cannot afford to get this decision wrong. Jason Garrett may be that guy. I honestly feel great about his ability to be an emotional leader. But, I wonder about his ability as a game strategist for now and I have no idea yet about his ability to evaluate talent and more importantly, whether his opinion will matter to the Jones family in the war room. This cannot be a knee jerk decision. This must be free of emotion and properly thought out. If the only way this team can improve its personnel evaluation process is to go get Cowher, then that is an easy decision. Jason Garrett may be the most promising young coach in the NFL, but this job, with this owner, calls for way more than that. The biggest issue still remains the biggest issue. The man who must evaluate all of this is the man who is responsible for why this job is why it is. Is there any chance Jerry can get this decision right? If you are a Cowboys' fan, that should be your biggest Christmas wish. 11/10 Marcus Spears Placed on IR (calf). Jimmy Saddler-McQueen signed. Jeremy Clark signed. Akwasi Owusu-Ansah Placed on IR (ankle). 11/4 Bryan McCann Activated from the Practice Squad. Ross Weaver practice squad addition. 10/18 Robert Brewster practice squad addition. 10/15 Jesse Holley Activated from the Practice Squad. Robert Brewster cut. 10/5 Alex Daniels practice squad addition. 9/24 Scott Chandler Activated from the Practice Squad. Deon Anderson cut. 9/18 Cliff Louis practice squad deletion. Bryan McCann practice squad addition. 9/9 Miles Austin signed (six-year extension (through 2016)). Tashard Choice was able to play for a series in the 3rd Quarter when Felix Jones was being checked for an injury in the locker-room. It was the short series after Sean Lee and Jason Hatcher came up with the fumble inside the Lions 20. Choice did a nice job in his limited duty, including a very key blitz pickup on the Touchdown throw to Austin. Otherwise, we saw that Marion Barber had the majority of the work as the game went on. Say what you want about Barber, but it is clear he is the best "closer" the Cowboys have and a real natural for that spot of running against 9 man fronts as the Cowboys try to run the 4-minute drill and kill the game. Problem is, just like in baseball, what is the point of having a closer if you never have the lead? As for Felix, we continue to see signs, but I would really like to see more before the end of the season where he proves that he is beyond a shadow of a doubt the #1 RB for the Cowboys moving forward. There have been hints and moments, but still, 3 years into his career, not enough to feel like that position is set for the next few years. There were 2 occasions where Barber and Jones were on the field for the same play. Neither play went well. The NFL ruled that last week's "sack" where Kitna had his foot stepped on by Kyle Kosier before Osi Umenyiora ran over and touched him was revoked off the official stat sheet. Therefore, we erase it off our charts and going into the Detroit game, the season total for sacks allowed dropped back to 16. Then, Sunday against the Lions, it was a clean 1st half, before the right side of the offensive line started breaking down a bit for 2 sacks and a safety. So, overall, the Cowboys have conceded 18 sacks. That is still well below league average. At the same time, our eyes tell us that they know their limitations. Max protect is being used quite a bit to protect some real weak spots on this Offensive Line. What Happened: This is a simple twist stunt that has befuddled the right side of the offensive line on several occasions this year. The object of the game is to make Leonard Davis move laterally. If you can, there is a chance that you will get right to the QB. It starts with 94-Jackson diving to the "B-Gap" which is the gap between Colombo and Davis. Then, Suh will curve around Jackson and attempt to get past the edge to the QB. The idea is that 1 defender sacrifices himself in an effort to occupy both blockers, but in this case, both Jackson and Suh beat their men to the QB and meet there. No way to say anything good about what happened here. Looks like Witten was trying to chip Jackson on his way out, but it might have actually helped him slide by Colombo even easier. What Happened: This is technically not a sack, but given it is a safety that could have cost the Cowboys the game, I thought we should include it regardless. Again, this shows what pretty much every team is trying to do with the Cowboys - isolate Leonard Davis 1 on 1. Very simple, Defensive End edge rushes to the outside, and the double team with Gurode is on the other guy to help out Kosier for a change. This is "22" personnel, so the Lions are not even thinking there will be a pass rush opportunity with the ball at the 4 yard line. But Ndamukong Suh working against Davis, it doesn't take long for him to see and seize the opportunity to get to Kitna. Davis likely saves a safety by holding, but as we know, that is just the same as a safety. What Happened: Here is a very confusing situation as "21" personnel is a rare Marion Barber/Felix Jones backfield at the same time. Again, it appears that the misdirection to Felix is the first plan, and then come back to Marion on a screen (I think - but this is pure speculation on my part). Anyway, in a screen, often you try to hold the rushers off for a moment, then release them upfield and drop the ball over the top of them. Regardless, this play doesn't work at all. It looks like Witten is left to try to block 94-Jackson by himself. As a tight end, Jason is a decent blocker, but as a tackle, he is overpowered by Jackson. It looks like Colombo is late to the scene, but again, without understanding the play call, this is all guess work. Regardless, you cannot take a sack on 1st and Goal at the 5. That could be an absolute game killer. The Rankings for the season in Sacks Allowed among the OL: Davis 4.5, Coverage 3.5, Colombo 2.5, Costa 2, Free 2.5, Gurode 1, Jones 1, Colombo.